Age of Discovery invites players to go around the world on board a ship where they can explore new places. These new places are well known for the fortunes and the treasures that are found within. The game has 25 betting lines and a total of five spinning reels. On those reels ,players will see plenty of symbols that are inspired by the game’s theme. This is why the symbols include a ship, a compass, a map, tropical fruit, sailing tools and equipment, a sea dragon and much more. 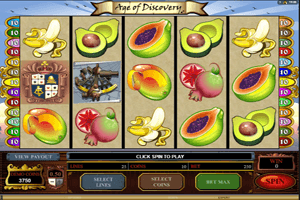 All of the symbols are of high quality visuals, which does not come a surprise since the game is powered by none other than Microgaming, which is one of the top names in the industry. The game has a bonus round that is called the Treasure Bonus Round. This round is triggered when lucky players get 3, 4 or 5 compass symbols scattered anywhere on the reels. Players can win up to 32,250 coins through this bonus. The golden coin is the wild icon of the game which can substitute other symbols, expect other bonus and special icons. Lastly, the sea dragon is the scatter icon that rewards players in scattered rewards when a minimum of 3 sea dragons land on any location on the reels.